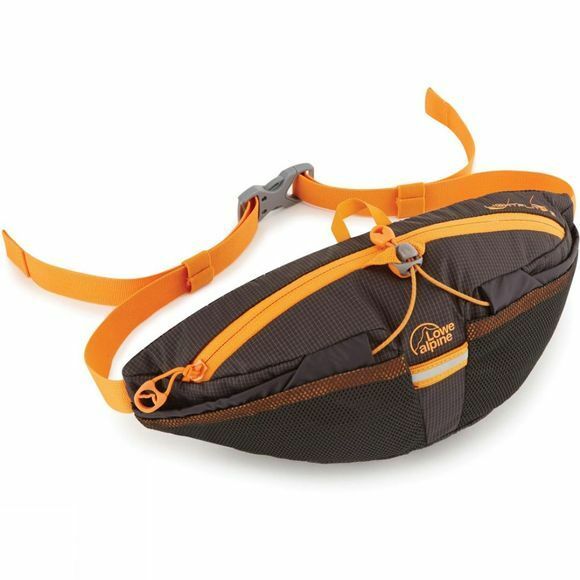 The Lightflite 2 Belt Pack from Lowe Alpine is a lightweight daypack designed for ultra-lightweight mountain activities! It has a sleek design with two fast access pockets to keep your energy bars or gels secure with easy access when required. It also has a padded wicking belt with an LED light loop so you can be comfortable and safe when completing your wild activities! In 1967 the Lowe brothers created their first backpack, the company continues the spirit of constantly innovating, developing new ideas and crafting solutions to the challenges of the outdoors. Whether it is the Aeon range: A new series of lightweight hiking packs, the comfort and breathability of the AirZone or streamlining travel and backpacking with the revolutionary foldable hipbelt on the Kulu, Lowe Alpine have innovated and created solutions for any outdoor activity. Today, the range of Lowe Alpine backpacks and accessories expands throughout several categories and activities, each one making the outdoors a more enjoyable and a safe place to explore. From large trekking and backpacking packs, to small, lightweight daysacks for the lightest and fastest ascents the Lowe Alpine range has something for everyone to make sure you enjoy the outdoors for longer. Lowe Alpine was founded in 1967, back when good quality outdoor kit was hard to find. So when they applied their mountaineering experience to practical design, they quickly created one of the finest and most respected ranges of rucksacks available. Today, the range of Lowe Alpine accessories and equipment expends through several categories, each one making the outdoors a more enjoyable and safe place to explore; whether that’s a long, multi-day excursion or simply a day out along a coastal path or forest trail with the family.